At the outset of World War II, North Carolina was one of the poorest states in the Union. More than half of the land was rural. Over one-third of the farms had no electricity; only one in eight had a telephone. Illiteracy and a lack of education resulted in the highest rate of draft rejections of any state. The citizens desperately wanted higher living standards, and the war would soon awaken the Rip Van Winkle state to its fullest potential. 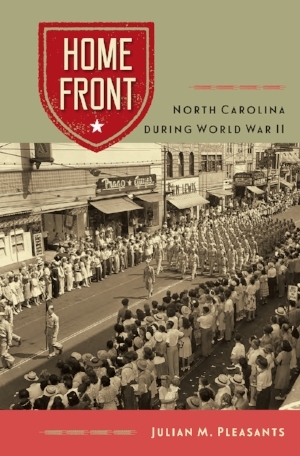 Home Front traces the evolution of the people, customs, traditions, and attitudes, arguing that World War II was the most significant event in the history of modern North Carolina. The conclusion of World War II found North Carolina drastically different. Families had lost sons and daughters, fathers and mothers, and brothers and sisters. Despite all the sacrifices and dislocations, the once provincial state looked forward to a modern, diversified, and highly industrialized future. Julian M. Pleasants is professor emeritus of history and former director of the Samuel Proctor Oral History Program at the University of Florida. He is the author of several books, including The Political Career of W. Kerr Scott: The Squire from Haw River. Join him for a reading and signing of Home Front at Main Street Books.